Most states in the US have some type of graduated income tax. This means that as your taxable income increases, the higher amounts of income are taxed at a higher and higher rate. There are several ways to express the relationship between taxable income and the corresponding amount of tax. In the state of Arizona, the instructions for Form 140 includes the table above for individuals filing single or married and filing single. 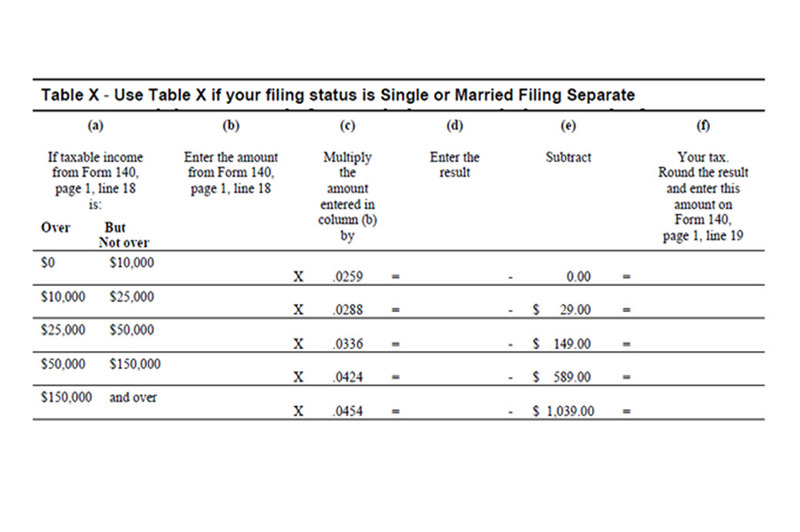 Column b represents your taxable income. Columns c, d, and e tell you what to do with that income to find your tax. Once the calculation is made, the corresponding tax is calculated in column f.
Looking at T(8000) and T(45000) where specific values of x were supplied, we see that we could use the formula 0.0259x or 0.0336x – 149 to compute the tax. As long as we know when each formula is applicable, we can apply the formula appropriately. This is exactly what the right side of a piecewise function does.